More target amplifications, Less budget pain! GenScript's advanced technology has led to the invention of high-quality PCR reagents, including the recombinant form of regular Taq DNA Polymerases, high-stability Taq DNA Polymerases, dNTPs, Master Mixes, and more. They simply provide you with instant access to high throughput PCR automation, offering cost-effective solution and satisfactory results. GenScript's best-selling Taq DNA Polymerase is a cost-effective recombinant enzyme.Taq DNA Ploymerase consists of a single polypeptide with a molecular weight of 94 kDa.Taq is the most common polymerase used for routine PCR. *These products are also available in larger package sizes. What is the recommended amount of Taq DNA Polymerase or Green Taq DNA Polymerase to use? Which buffer should I use if I want to control the level of magnesium in the reaction? Or does the presence of Mg2+ inhibit PCR? What is the recommended concentration of Taq Polymerase to use for a routine PCR reaction? 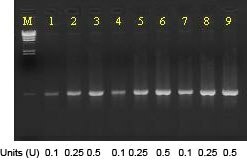 What is the upper limit for length of the product when using Taq DNA Polymerase from GenScript? If the product sequence doesn't completely match the expected sequence. How can this result be improved? A: The Green Taq contains Taq polymerase with a special stabilizer that allows it to be stable at room temperature for 2 weeks. A: We suggest using Mg-free Taq DNA Polymerase (Cat. No. E00008). What is the recommended concentration of Taq Polymerase to use for a routine PCR reaction?? A: Up to λdna 8 kb. A: There may be a problem in the PCR program or system, or a problem during the electrophoresis. How can I improve my results if the product sequence doesn't completely match the expected sequence? A: We suggest to use a high-fidelity DNA Polymerase which can offer the highest fidelity of any commercial thermostable polymerase. A: No. The exonuclease will only degrade double stranded DNA that it encounters while extending a DNA fragment. It will degrade a secondary primer if bound to the same strand (e.g. a mutagenesis primer). A: Please send all your issue via product@genscript.com, or load the protocol of the Taq DNA polymerase direcly. Wang X., et al. Salicylic Acid Regulates Plasmodesmata Closure during Innate Immune Responses in Arabidopsis. Plant Cell.2013 Jun;25(6):2315-29. Ruth B. Phillips., et al. Characterization of the OmyY1 Region on the Rainbow Trout Y Chromosome. Int J Genomics.2013 Mar;261730. FrÍas M., et al. The phytotoxic activity of the cerato-platanin BcSpl1 resides in a two-peptide motif in the protein surface. Mol Plant Pathol.2013 Qct;12097. Y Acanda., et al. EMS mutagenesis and qPCR-HRM prescreening for point mutations in an embryogenic cell suspension of grapevine. Plant Cell Rep.2013 Dec.
Firlej A., et al. A Multi-Approach Study to Delineate Interactions Between Carabid Beetles and Soybean Aphids. Environ Entomol.2013 Feb;42(1):89 - 96. Zhou P., et al. IGF-I Signaling Is Essential for FSH Stimulation of AKT and Steroidogenic Genes in Granulosa Cells. Mol Endocrinol.2013 Mar;27(3):511 - 523. Wang X., et al. Silencing of the Host Factor eIF (iso) 4E Gene Confers Plum Pox Virus Resistance in Plum. PLoS One.2013 Jan;8(1):e50627. Chiorazzi M., et al. Related F-box proteins control cell death in Caenorhabditis elegans and human lymphoma. Proc Natl Acad Sci U S A.2013 Mar;110(10):3943 - 3948. Doyle VP., et al. Habitat and Host Indicate Lineage Identity in Colletotrichum gloeosporioides sl from Wild and Agricultural Landscapes in North America. PLoS One.2013 May;6(5):e62394. Jun TH., et al. Genetic mapping of three quantitative trait loci for soybean aphid resistance in PI 567324. Heredity (Edinb).2013 Jul;111(1):16-22. Carol D. von Dohlen., et al. Diversity of proteobacterial endosymbionts in hemlock woolly adelgid (Adelges tsugae)(Hemiptera: Adelgidae) from its native and introduced range. Environ Microbiol.2013 Jul;15(7):2043-62. Gandhirajan RK., et al. Blockade of NOX2 and STIM1 signaling limits lipopolysaccharide-induced vascular inflammation. J Clin Invest.2013 Feb;123(2):887-902. Zhou JB., et al. Identification of a novel gene fusion RNF213â€'SLC26A11 in chronic myeloid leukemia by RNA-Seq. Mol Med Rep.2013 Feb;7(2):591-7. Jessica Hoppstdter., et al.Glucocorticoid-induced leucine zipper is downregulated in human alveolar macrophages upon Toll-like receptor activation. Eur J Immunol.2012 May;42(5):1282-93. Sheng H., et al. Mapping QTL for resistance to eyespot of wheat in Aegilops longissima. Theor Appl Genet.2012 Jul;125(2):355-366.